“Spooky action at a distance” is how Albert Einstein famously derided the concept of quantum entanglement—where objects can become linked and instantaneously influence one another regardless of distance. Now researchers suggest that this spooky action in a way might work even beyond the grave, with its effects felt after the link between objects is broken. In experiments with quantum entanglement, which is an essential basis for quantum computing and cryptography, physicists rely on pairs of photons. Measuring one of an entangled pair immediately affects its counterpart, no matter how far apart they are theoretically. The current record distance is 144 kilometers, from La Palma to Tenerife in the Canary Islands. The insight came when Lloyd investigated what happened if entangled photons were used for illumination. One might suppose they could help take better pictures. For instance, flash photography shines light out and creates images from photons that are reflected back from the object to be imaged, but stray photons from other objects could get mistaken for the returning signals, fuzzing up snapshots. If the flash emitted entangled photons instead, it would presumably be easier to filter out noise signals by matching up returning photons to linked counterparts kept as references. Still, given how fragile entanglement is, Lloyd did not expect quantum illumination to ever work. But “I was desperate,” he recalls, keen on winning funding from a Defense Advanced Research Projects Agency’s sensor program for imaging in noisy environments. Surprisingly, when Lloyd calculated how well quantum illumination might perform, it apparently not only worked, but “to gain the full enhancement of quantum illumination, all entanglement must be destroyed,” he explains. As a possible explanation, Lloyd suggests that although entanglement between the photons might technically be completely lost, some hint of it may remain intact after a measurement. “You can think of photons as a mixture of states. While most of these states are no longer entangled, one or a few remain entangled, and it is this little bit in the mixture that is responsible for this effect,” he remarks. If quantum illumination works, Lloyd suggests it could boost the sensitivity of radar and x-ray systems as well as optical telecommunications and microscopy by a millionfold or more. It could also lead to stealthier military scanners because they could work even when using weaker signals, making them easier to conceal from adversaries. Lloyd and his colleagues detailed a proposal for practical implementation of quantum illumination in a paper submitted in 2008 to Physical Review Letters building off theoretical work presented in the September 12 Science. Actually proving this effect may be the real challenge. The easy part is creating entangled photons: just shoot light through a special, “downconverting” crystal that acts as a beam splitter; it produces separate yet linked rays. One ray illuminates the object, and the other serves as a reference. The returning and reference beams then are merged together (basically, by making them go through a splitter in reverse); the photons that were entangled should be more likely to recombine, or “upconvert.” But any experiment to prove that quantum illumination can boost the sensitivity of imaging has to use weak signals, and creating materials capable of upconverting faint beams with high efficiency is technically daunting, Kumar says. Still, Lloyd predicts experimental tests of this scheme might come later this year. Besides boosting imaging sensitivity, the effect might confer benefits on quantum computing or quantum cryptography, Kumar suspects. “The quantum world is quite exotic and complex, and this shows there are surprises there that lurk around corners all the time,” he says. 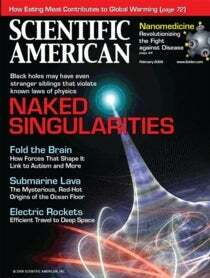 Note: This article was originally printed with the title, "Quantum Afterlife".